And this past week we’ve had changes in 23andMe pricing, in the presentation of results from Family Tree DNA, and in requests to Family Tree DNA’s mtDNA customers to consider participating in research. Let’s take a look at those three new developments today, since those are raising questions among genealogists. Perhaps the biggest news of the week was the price drop at 23andMe from $299 to $99, a move that prompted two reader questions. Reader G. Johnson said she “would be interested in (The Legal Genealogist‘s) take on this” and wondered who this test would be best for. The 23andMe test that’s been repriced is its Relative Finder test, the same basic autosomal testing that’s done by Family Tree DNA under the name Family Finder, and that’s done by AncestryDNA. So anyone can take the test — men and women alike — in the hopes of locating genetic cousins with whom to share genealogical information. In terms of the basic science behind all of these tests from all three companies, they’re all solid and, for genealogical purposes, your best bet is to test with as many different companies as you can afford. The reason is simple: most people will choose one company and test with that one. But, if you’re like me, with brick walls all around your family history, you want every match you can get — and that means going to all the places where those cousins can be found. Right now, with this price drop, the absolute best bang for the buck in autosomal DNA testing is to do the Relative Finder test with 23andMe for this new $99 price (so you get the benefit of all the genetic cousins you’ll have who’ve tested with 23andMe) and then transfer your results to Family Tree DNA for $89 (so you get the benefit of all the genetic cousins you’ll have who’ve tested with Family Tree DNA). So that’s the basic price news. 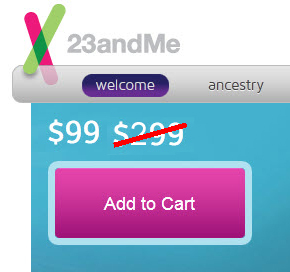 But reader Vicki Wright asked: “any quick thoughts about the 23andMe repricing to $99? I feel like I’m missing something in this news….” And yeah… there are some underlying considerations here that are a bit troubling. • Broaden access for people seeking to manage their health and well-being through direct access and greater understanding of their own genetic data. These are all good things — but they have nothing to do with genealogy. 23andMe’s genealogical functions continue to take a back seat to its emphasis on health testing, which means a default setting among 23andMe users of confidentiality and not sharing information, as opposed to the genealogical default setting of sharing widely. Though, like any consumer, I love a bargain, I also worry about the ability of 23andMe’s competitors to stay competitive in the face of this kind of price pressure. And losing any of our options for genetic genealogy testing would not be a good thing overall. Much of the obvious change in the Family Tree DNA results is in the presentation. 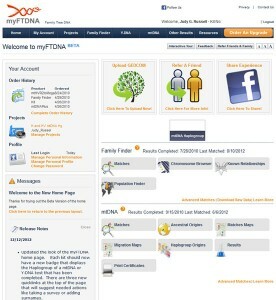 There’s a new beta-version home page for each user called myFTDNA that’s more graphical and will show updated results and action items more easily. It’s clean and intuitive and unlikely to cause any consternation to anyone who’s used the previous systems — and there’s a link to go back to the previous results system for anyone who’s confused. It used to be that I had four matches reported to my full mtDNA, and all were reported as exact matches. Now I have 11 matches, none of them exact but ranging from one to three steps difference. This obviously opens up new avenues for sharing information. There are also reporting changes in the YDNA results. YDNA, again, is the gender-linked DNA passed only from father to son to son.7 Some matches have been eliminated, others have been added, and the calculation of how likely it is that the match occurred in a particular time frame (how many generations in the past) is also being reported differently. Yup, sure can, and I’ll begin by telling you that I contributed my results years ago when I first did this test. As a national resource for molecular biology information, NCBI’s mission is to develop new information technologies to aid in the understanding of fundamental molecular and genetic processes that control health and disease. More specifically, the NCBI has been charged with creating automated systems for storing and analyzing knowledge about molecular biology, biochemistry, and genetics; facilitating the use of such databases and software by the research and medical community; coordinating efforts to gather biotechnology information both nationally and internationally; and performing research into advanced methods of computer-based information processing for analyzing the structure and function of biologically important molecules. 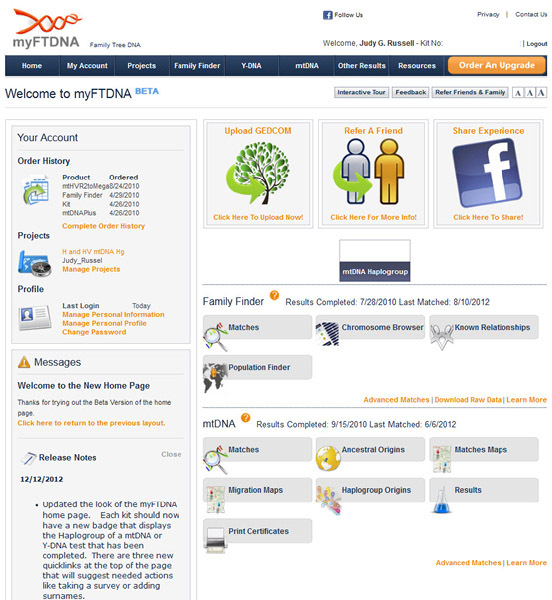 Among the research being done in genetics these days is research into mtDNA, and one of the big sources of mtDNA genetic information is Family Tree DNA — the only genetic genealogy company that does full mtDNA testing. So Family Tree DNA has always made it easy for its customers to consent to the submission of their mtDNA test results to NCBI. If you consent, all information that identifies you individually is removed and just the results are sent along and added to NCBI databases where scientists throughout the United States and, in fact, around the world, can access it. The email Eileen received — which mirrors what Family Tree DNA says on its website — explains that scientific studies resulting from analysis of your data (and mine and everyone else’s in the database) will be published in peer-reviewed journals such as Copernicus — which is an open access scientific publisher, and will be included in those NCBI databases. No personally-identifying information is ever included in those without the explicit personal consent of the test subject. The rest of the email is a basic warning: giving consent is a bit like the genii and the bottle — once your data is out there in those databases, it’s out there. Yes, you can withdraw consent down the road — but there really isn’t any way to remove your data from all the places where it may have already ended up while it was in those databases. There’s no way to contact a scientist in, say, Brazil or Malaysia who accessed the information for a study and have just your results removed from whatever was accessed. If you have any concerns about having your data anonymously available, just say no. Me, I said yes. Your choice. Thank you. I think I will say yes. Yep, the letters we all received (me included) specifically mention NCBI, Bob. Geno 2.0 is looking at (and for) different things in the mtDNA using specific sampling areas. Hi Judy. We’re on the same wavelength today. I came seeking your DNA expertise and found exactly what I needed. I took your advice and ordered the $99 23andMe test, which I will later transfer to Family Tree DNA. Enjoy your holidays. So glad I was able to help, Pam! Between you and CeCe, those interested in DNA testing will alway get the best news. As you mentioned about 23andMe’s preference for health testing instead of testing for strictly genealogical DNA testing is a gamebreaker for me. But it is good, in most respects, that they are pushing forward the way that they are. Let’s hope that the others can keep pace. Now, I just need a relative for my FTDNA Y-37 test! So did I understand correctly that 23andme will use our info for their own profit somewhere down the road and FtDNA just donates it to research? Thanks for explaining the current changes in this field. I just ordered the 23andme test and will consider FTDNA once I have my results. That’s the situation currently, Marsha. That doesn’t mean that FTDNA won’t be forced down that road in order to stay alive. but for today, yes. 23andMe only sells one test and it includes all of their offerings. Relative Finder is just one of many features at 23andMe. Thanks for keeping everyone updated! Ah, yes. I guess I just tend to think of it as Relative Finder, when that is a feature, not a test name. Thanks!